we are in the process of rejuvenating the beautiful grounds at St Joseph's School. The pathway connects the Junior (Lower) to the Intermediate (Upper) School via a sequential journey. The values, ethos, and history of the school are highlighted along this route with sculptures and community artwork, information boards and special landscape features. The design provides the Junior School with a strongly developed sense of place which connects the children to their immediate environment. The overall space provides a foundation for enhancing cognitive, social, emotional and physical development. The multi-functional spaces and the emphasis on visual poetry and sculpture are intended to inspire natural play, adventure and exploration. 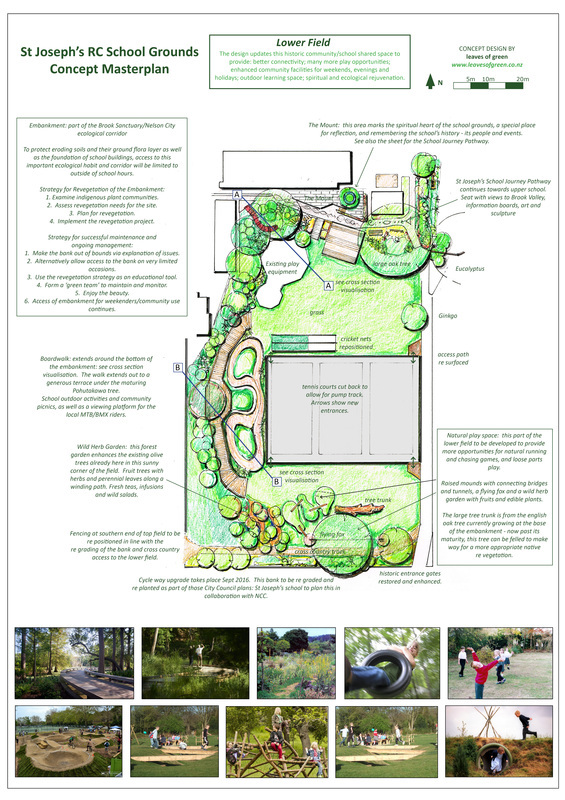 The design updates this historic community/school shared space to provide better connectivity, many more play opportunities, enhanced community facilities for weekends, evenings and holidays, outdoor learning space, spiritual and ecological rejuvenation.